Our first stop was at Mozzocco Winery (which was packed) where we tasted 3 different zinfindel's out of the barrel and a couple finished wines. They were also grilling steak on the BBQ and we stopped by one of their tables to get out of the crowd and sit and enjoy for a bit. Sammi and I. I really like the composition with us in the left but I don't like the people in the background. I cropped them out but I like the dimensions in this one better. Our first stop was at Mozzocco Winery (which was packed) where we tasted 3 different zinfindel's out of the barrel and a couple finished wines. They were also grilling steak on the BBQ and we stopped by one of their tables to get out of the crowd and sit and enjoy for a bit. 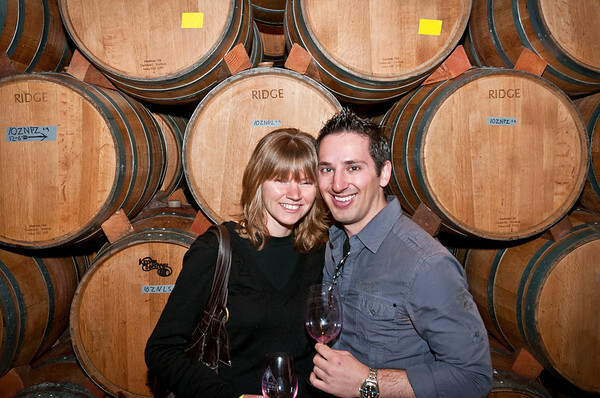 Sammi and I.
I've been a club member (ATP collection) of Ridge Winery now for a year or two and really like their wine (obviously). 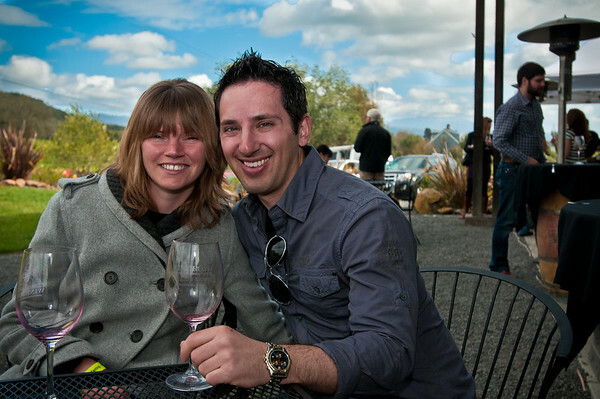 They have 2 tasting rooms, one in Cupertino (called their Montebello Tasting Room because it's on Montebello Road, in the Santa Cruz Mountains overlooking all of the Bay Area) and one in Sonoma (called the Lytton Springs Tasting Room because it's on Lytton Springs Rd). 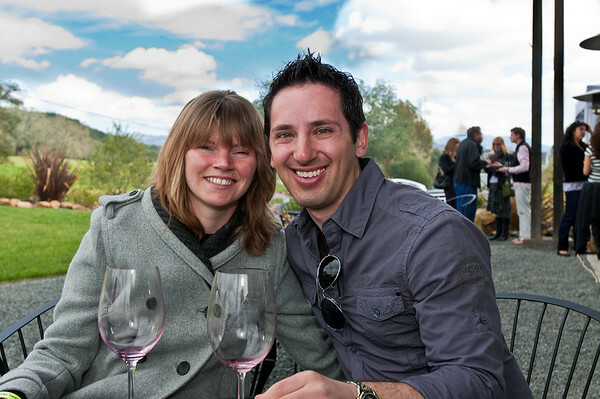 I go to the Montebello Tasting room fairly often because they have monthly events but this was the first time at the Lytton Springs tasting room. 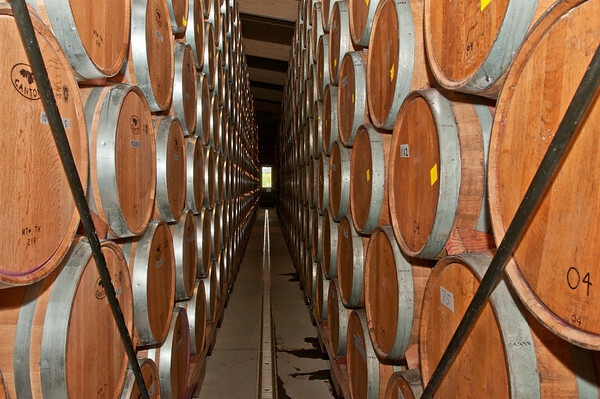 Here's their big barrel room where they store all (well, a lot of it) their wine to age in barrels. Here you see some barrels from 2004. I think the wine in it is the 2010 harvest though, as some of the barrels have masking tape that says "10ZNLS" which stands for "2010, Zinfindel, Lytton Springs" or "10ZNEB" for "2010, Zinfindel, East Bench". 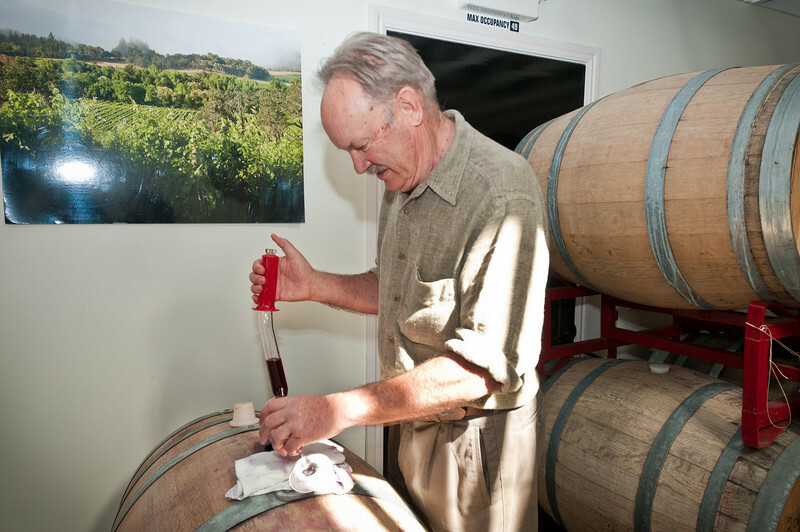 As a side-note: Ridge specializes in single-vineyard winemaking. What this means is that instead of producing a wine that has grapes from various vineyards, all the grapes in a specific bottle came from the same vineyard. 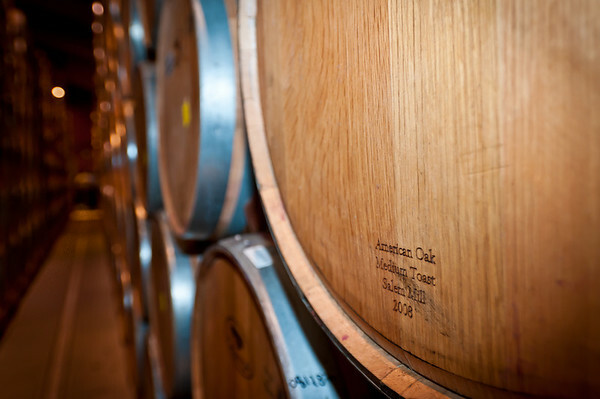 Additionally, instead of making a 100% "Zinfandel" or a "Merlot" their bottles are named after the vineyard the grapes come from and contain all the grapes that were grown there. So if the vineyard happened to have Zinfandel, Petite Sirah and Carignane grapes (like the Lytton Springs vineyard), their Lytton Springs wine will have all 3 in it. The 3 wines we tasted from Ridge's barrels. 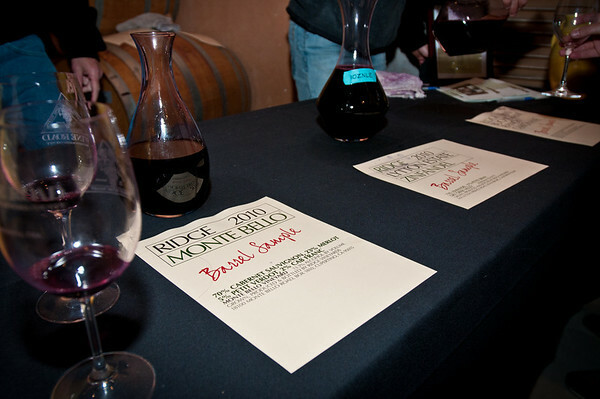 The 2010 Buchignane Ranch, the 2010 Lytton Estate Zinfandel, and the 2010 Monte Bello (which is a $150 bottle when it's released. Way over priced if you ask me). 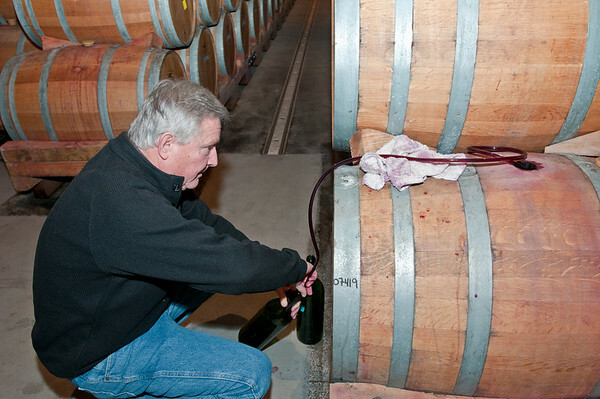 The guys at Ridge had to syphon out the wine from the barrels. 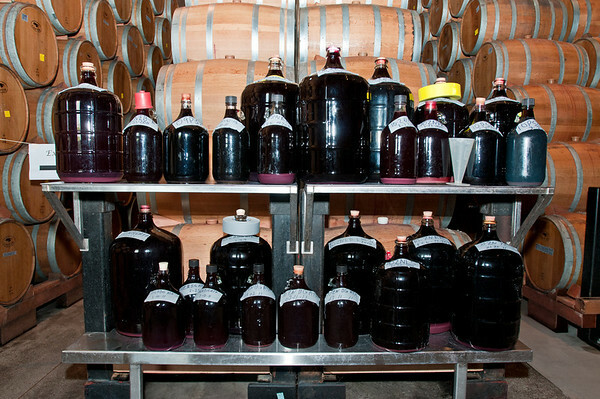 After siphoning out the wine from the barrels they put it in these huge jugs. Fun! Pano of the view outside of Ridge Lytton Springs. 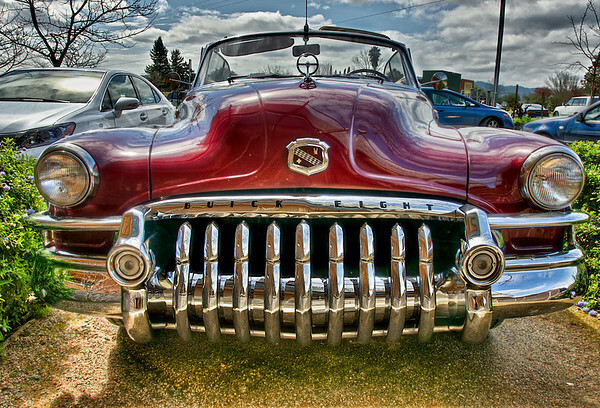 While we were hanging out at Ridge I noticed there was a sweet old Buick in the parking lot. 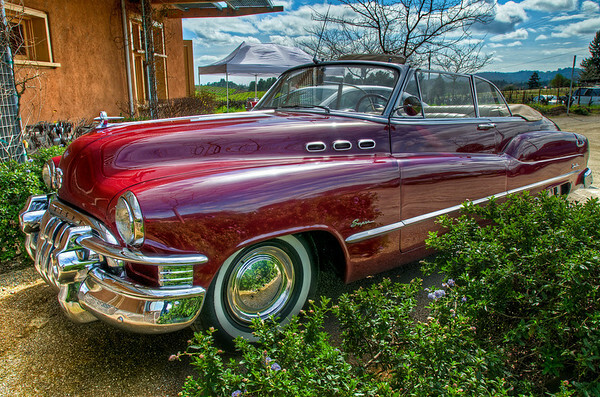 I couldn't resist and took a couple HDR's -- just for fun effect! We ate lunch on this bench outside at Ridge. It was a beautiful day and Sammi and I had brought sandwiches with us (we came well prepared). 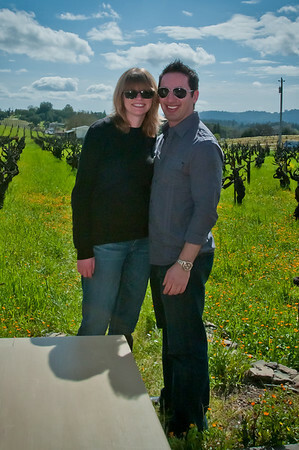 I had warned Sammi earlier that I'd want a picture with her in front of the vineyard. When I said it was time she rolled her eyes and looked at me with the face that said "are you serious?"! Since she was being un-cooperative I picked her up and put her in her place (not really, but it made a cute photo)! Sammi finally agreed to be in a photo with me. Ok, I can't really say "finally" since she took a bunch of other photos with me earlier. Getting some wine out of the barrel at Hawkes. I think this was our favorite tasting because they were having us taste their 2009 wine, which had a year of aging and had matured quite nicely. If their bottle of the "Red Winery Zinfandel" hadn't been $60 I prob. would have bought one!